The night went quick, yet you feel rested when you hear Tumbleweed tearing down his tent. Feeling rested and feeling like crawling out of your sleeping bag are two different things, so you roll over. It’s going to take more sun than what’s currently showing to get you out of your tent. You inventory your hurting parts and are surprised to find everything seems mobile. Nice. You’re getting used to this. Tumbleweed stops by your tent to tell you he’s going down to the car to make coffee. You tell him you’ll be there in 15. So 15 minutes later you get up and pack your gear down to the car. The camping spot is just off the Gold Hill Trail. Very convenient – this will be your earliest start yet. Your car is at the trail at the other end of today’s trek at Copper Mountain. Tumbleweed has a burner setup in the gravel parking lot with some water boiling for coffee. You both have two cups and then some oatmeal with honey. This is Tumbleweed’s typical morning routine when he’s backcountry camping. Yours’ so far has been McDonalds, but flexible as always, you find this satisfying. 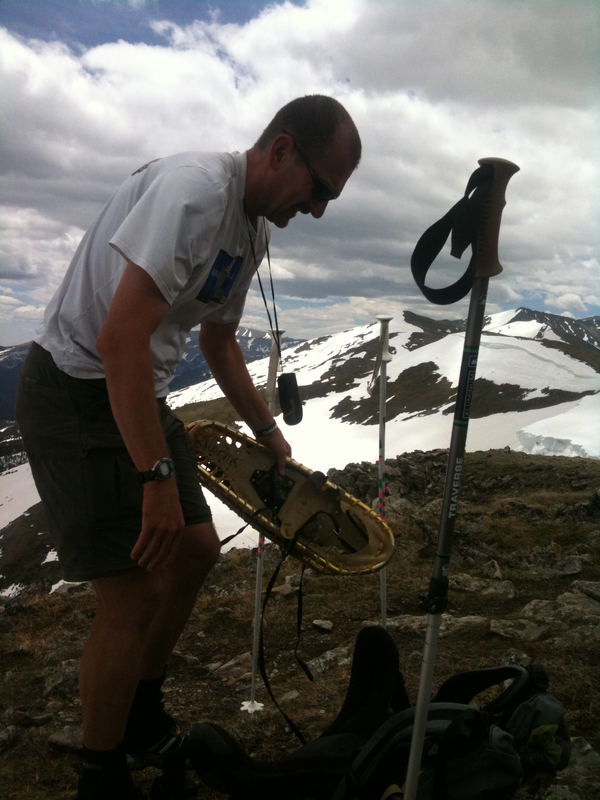 At 6:30am, you pack up your snowshoes and head out to cross the Ten Mile Range. The trail is gorgeous. You encounter a woman running from the other direction within the first mile. You don’t feel the need to run today. Yesterday’s best trail run ever has you satiated. And you’re a bit stiff still. You maintain a strong pace but walking nonetheless. Today’s first hill takes you from 9200 feet to over 10,000, then drops back down to about 9900 feet at mile 3. 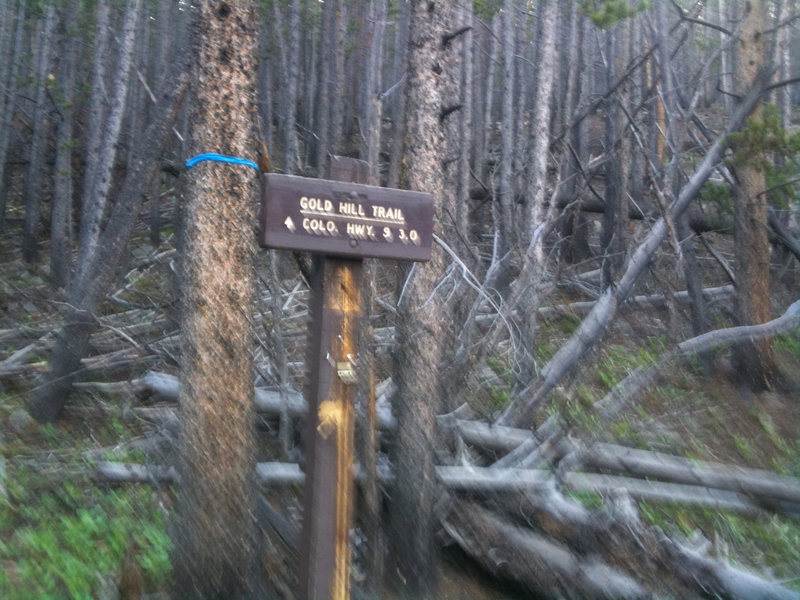 Around this point you turn left onto the Peaks Trail for about a half mile until you reach Miners Trail. Man, the blokes that live around here have a lot of trails. 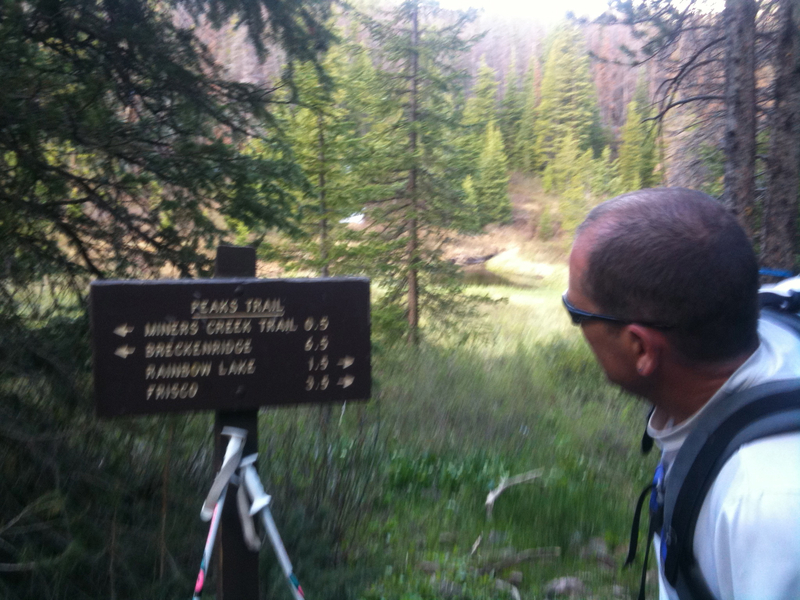 They have hiking trails along with paved biking trails all the way from Breckenridge, though Frisco and Copper Mountain to Vail. Sweet. Miners Trail, before 4 miles, begins the big climb up to the ridge crest. 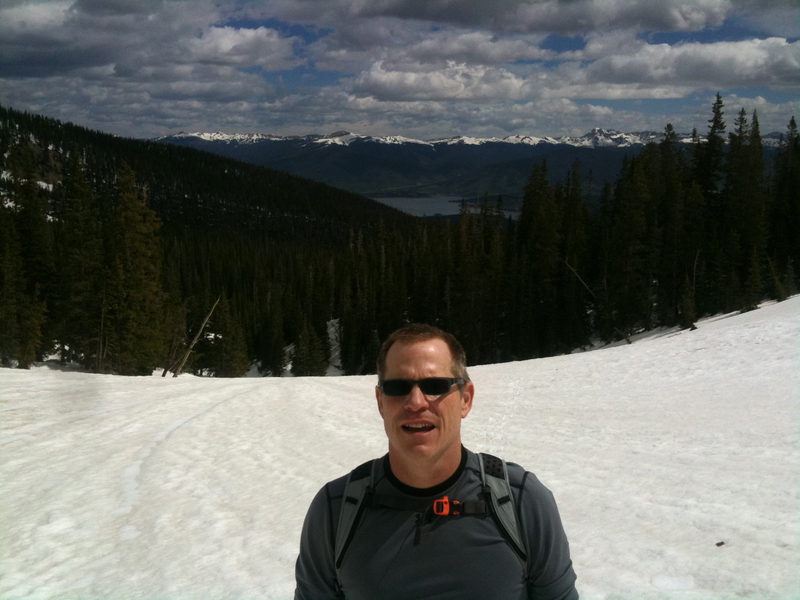 You need to snowshoe before hitting tree line, maybe around 5 or 6 miles, but it’s not bad. You’ve picked up some skill at it, and the snow is hard enough to support your 180 pounds without post holing. The snow doesn’t even get deep until close to tree line. Your pace slows down then. There’s extensive sidestepping across the tundra, and sidestepping in snowshoes is hard. Sidestepping in snowshoes at Tumbleweed’s pace is even harder. He seems to float across the tundra. You’re hanging ok but it’s real work. Then the views begin and you forget about the pain in your thighs and calves. You’re not sure which is peak 2 or 3 or 4 or 5, but they are all right in your face. You can see the cornices up close and wonder about the likelihood of avalanches. It seems like you are still separated by a small ridge from the peaks, so you don’t worry. You maintain Tumbleweed’s constant pace. He’s concerned about crossing the ridge before it gets cold. The forecast calls for thunderstorms and the sky looks like it could do anything it wants from giving you a sun burn to blowing a blizzard. You keep up. Reaching the ridge literally takes hours and feels like the entire day. The approach to the pass between Peak 5 and Peak 6 is deceiving. You keep thinking you’re there but there’s always a little more to go uphill. 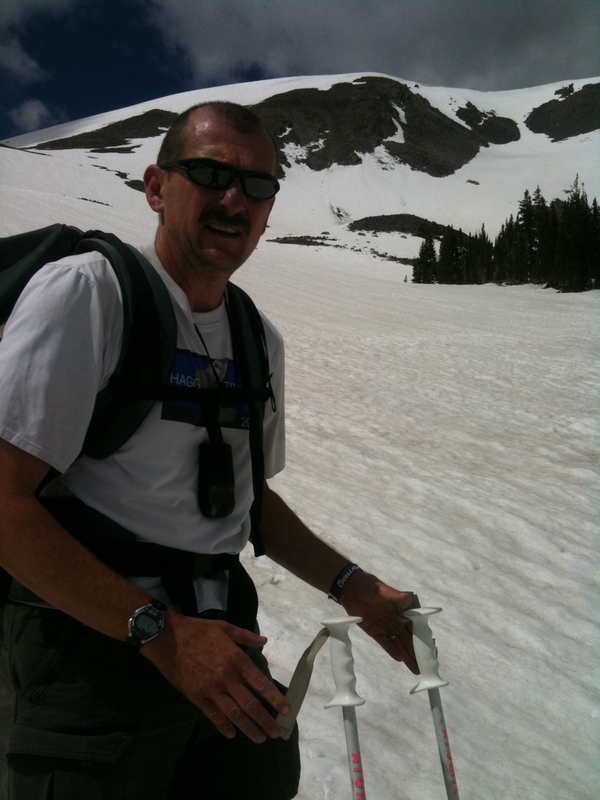 You do become concerned about avalanches by the time you’re almost under the cornice of Peak 5. This picture captures your wonder as you stare at the cliff wall. Although to be fair, the more likely cause of your gaping mouth is that you’re sucking wind at 12,000 feet. Tumbleweed snaps the photo of you with Lake Dillon in the background. Just a few steps beyond Peak 5 is the crest and you find the snow melted on the western slope. It feels good to shed the snowshoes. You need to don your jacket though as the wind is howling up here like a banshee from Celtic hell. Otherwise, this has been shorts weather. You didn’t even need your gators until the snow got deep. On this side of the Ten Mile Range, you find that you need to switch in and out of your snowshoes multiple times until you work your way below 11,000 feet. Tumbleweed works the Garmin waypoints like a space pilot. This is another crucial piece of gear that makes this hike passable before July. The trail is fairly straightforward however. From the crest you continue south for over a mile, then reach a switchback that turns you north for nearly the remainder of the trail. And it’s at this switchback, where Wheeler Trail starts, that the snow ends to the point you can remove your snowshoes. It’s an easy 3 mile cool down dropping into Copper. This hike is over. But wait, what’s this? 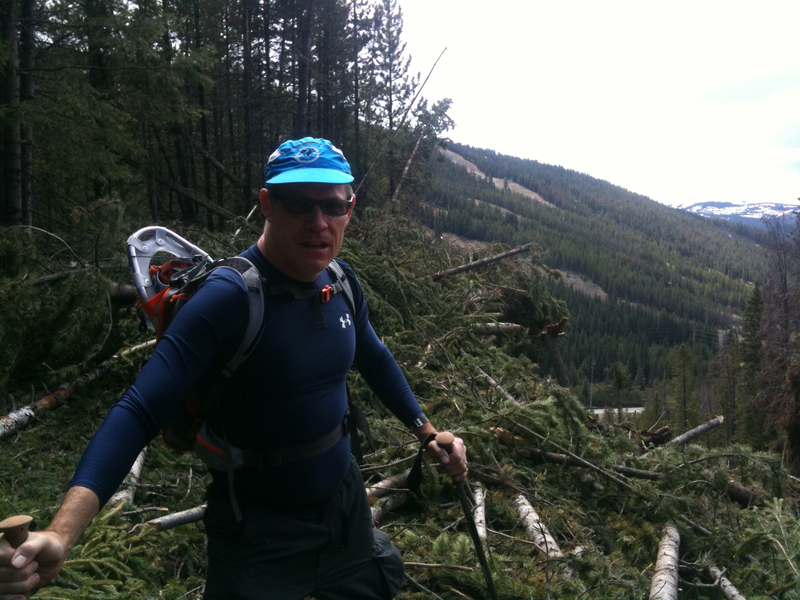 Well below treeline at the first wooden bridge, you run into hundreds of downed trees – the apparent victims of an avalanche. Wow! Although a fairly contained area, the destruction is huge. But the bridge survived. Crossing is an ankle-biter and the poles help. Soon you’re crossing more bridges as you’re in a bog. Then you reach the trail head. Your first two day CT affair is over and it was epic. Certainly the most amazing views to date. You change into comfortable clothes and shoes and then drive back to Gold Hill. After picking up Tumbleweed’s car, you turn toward Frisco and stop at the first open restaurant in search of calories. 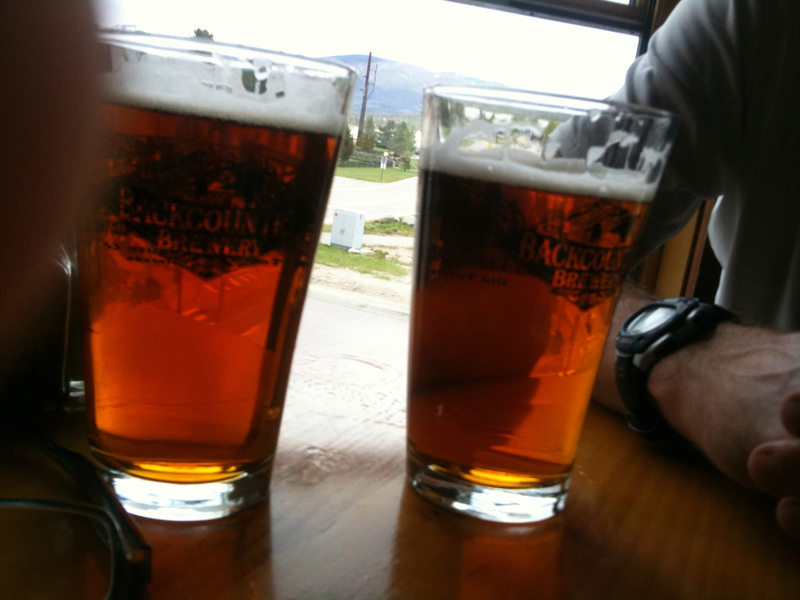 The first place is Backcountry Brewery at Hwy 9 and Main in Frisco. You’ve been here before so you know the food is decent. You start with beer and nachos. The kitchen is a bit slow to meet the demands of your low blood sugar; which reminds you that weed is legal in Breckenridge so urgency should not be expected. When those nachos do arrive, you devour them like Stuntman Mike and order another Switchback Amber. Tumbleweed orders another Telemark I.P.A. You can’t even recall the burgers well enough to blog them after this point, it’s all a food blur. You know it was good. You make plans for hiking segments 8 and 9 over the 4th. Then you head home east and Tumbleweed drives west. Good story. Makes me feel like I was there.